You’ve finally decided on a color and removed all furniture from your living room. As eager as you might be to begin painting, rushing into the project can lead to mistakes that take significantly more effort to resolve down the road. To help prevent additional work, here is a list of the most common mistakes you’ll want to avoid when completing your next interior painting project. You might not notice it at first glance, but chances are your walls are covered in dust, dirt and small debris from years of remaining untouched. Oftentimes, when large pieces of furniture are placed against a wall, dust collects behind it coating the surface of your wall. Furthermore, the constant moisture build-up in your bathroom can cause your walls to develop a thick film that prevents the adhesion of new paint. In all cases, you’ll want to follow the same procedure of washing the wall with a solution of TSP and water and letting dry completely before applying any primer or paint. Obviously, you want your walls to be dry to the touch before you begin painting. But you also want to check for areas where the drywall might be damp from moisture behind the wall due to a leak or penetration from water outside the home. If you feel any soft spots on the walls or see paint blistering or water stains, be sure to investigate before beginning the painting phase of your project. While latex paints are used most commonly in general interior painting applications today, this wasn’t always the case. If you have an older home, chances are that the wall, ceiling and trim surfaces are coated in oil-based paint. The general rule of thumb is that if you’re transitioning from oil to latex or vice versa, it’s necessary to use a quality bonding primer, such as Benjamin Moore’s Fresh Start Primer to ensure proper adhesion. Slapping latex right on top of oil-based paint without any preparation may lead to blistering and peeling. You may think that applying a thicker layer of paint to cover up mistakes underneath is an easy fix, but beware that this is not a permanent solution and can lead to inconsistencies in finish. The best rule of thumb is to apply one coat of primer tinted to the same color as your finish coat, and one coat of the paint of your choice. To avoid drips and sags, don’t overload your brush or roller, but put enough on so that it slides easily across the surfaces applying a minimal layer of paint. 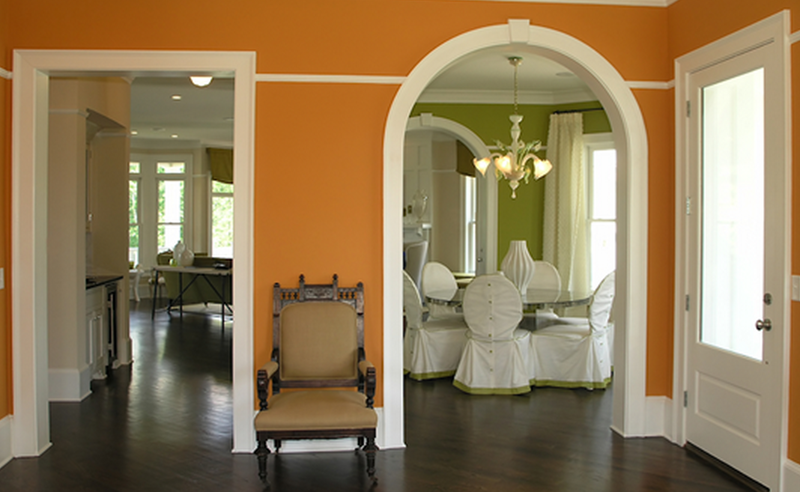 Repainting a room in your house can really freshen up your entire space. But if you’re not careful or not sure how to approach the project, it may be best to hire a professional to do the job for you. This entry was posted in Installation Guide and tagged Interior, Painting, Preparation, Repair. Bookmark the permalink. ← What Causes Paint to Peel?